Some of these videos don’t cast Shreveport in a very progressive light; you’ve been warned. Hey, every once in a while, it’s therapeutic to find a quiet place, sit down, watch some really embarrassing viral videos from the place you call home, and have a good cry-laugh. This is one of those times. Press play, bury your head in your hands, and and laugh your way into hysteria. Oh my. That sound you just heard was the whole state of Louisiana face-palming. Barbara Norton, this was not one of your better decisions on how to spend taxpayer resources. On the bright side, though, it could’ve been worse. Video here. 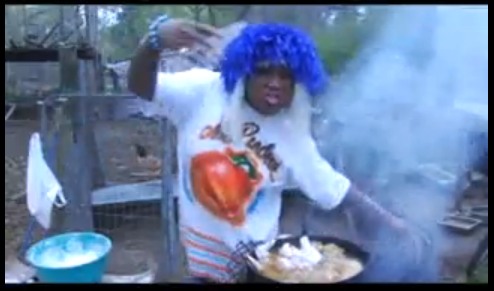 I have no idea who Ms. Peachez is or where she got that air-brushed shirt, but I love her and I want one. And I want some of that chicken! A private school kid with his friends, pelvic-thrusting in a gorilla mask while pushing a vacuum cleaner on a baseball field. We’ve all been there. I have watched this video at least 5 times. I don’t understand why, but I laughed every time. This is ridiculous. This video has 2.6 million views. Let that sink in. Sweet Jesus, King of Kars, it appears that you’re missing a “K” from your initials. The only thing that would make this commercial more racist would be separate drinking fountains. Oh wee, this racism is killin’ me inside. I need a shower and a nap after watching those.